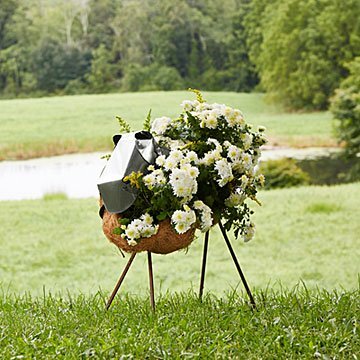 Part farm animal, part metal art, this handmade piece adds a baaa-eautiful touch to your garden. This sweet guy was the "metal sheep" of his family. He preferred landscaping and gardening to selling wool. Now he comes home with you to spruce up your outdoor space. John and Heather Zondervan's unique planter is both a charming farm animal and sophisticated piece of metal art. The creative duo handcrafts the design, shaping his head from galvanized steel and creating his body from sturdy carbon steel. He comes with cocoa lining, you just have to pick your favorite fluffy plant—we recommend coleus or plantain lilies—to fill out his "coat." A great gift for animal lovers and gardeners alike, the piece makes a baaa-eutifal addition to their space. Handmade in Canada. A welder as a birthday present? What was her husband thinking? This turned out to be the most significant gift Heather Zondervan ever received, as it set a new course for her creative work. Her experience in costume design has helped to add construction knowledge and a theatrical flare to the art she now fabricates in metal. John’s love of wood and background in cabinet making has added another dimension to the metal art. Together the pair design and produce a broad range of metal and wood accents for the home and garden. The body and legs will develop a natural rust patina over time. Can stay outdoors year around.